Old materials and pieces made new: always tricky in the jewelry world, as an unhappy marriage comes with a steep price tag, but a felicitous union thrills. I have enormous respect for artisans whose work sets them apart. But some readers have e-mailed me asking for ideas that a good local jeweler can adapt. And some of you wield pliers with power and grace; you assure us that with an evening to spare and a threading needle, we can achieve something divine. I'm keeping it simple, though; my lone foray into necklace-making led me shamefaced to the pros for rescue. So, for your idea board, three options: the first, a master's calling card, the second, one for a proficient jeweler, and finally, a reno that you could do in front of your TV. Here's another treatment, a marbled violet bakelite bangle with inlaid lilac harlequins, $2,200. Loving the rich iridescence and colour play. Not many jewelers can apply inlay–which is why Davis is on my ship-comes-in list; however, most cuffs or bangles can be reno'd by the the addition of bezel-set stones. Small diamonds languish for decades, plunked into tired engagement rings. Why not keep the sentiment but set the stone into something brilliantly cool? Voilà, a Pat Flynn iron cuff with a dusting of 22k gold, set with a 1/3ct marquis diamond vaults that little sparkler out Akron. 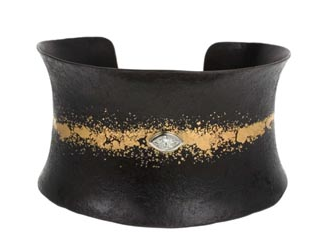 Or if you want to buy the bracelet, it's $3,800 at Twist. If adapting this idea, you don't need a diamond; any stone of the right proportions will work: a silver cuff with a slice of fire opal, bronze with a sprinkle of garnets, gold with coloured stones from discreet smoky topaz to flashy paraiba tourmaline. 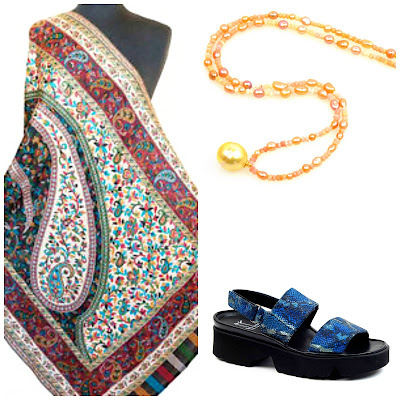 Have you too-small pearls or a strand that 'shrunk' around the neck? Why not pull them apart to make one or more stretch bracelets? If making your own (directions here), remember the holes in your pearls need to be big enough to fit the elastic thread. (Pearls typically have .8mm holes; some are drilled at 1mm.) Use a strong, clear stretch cord like 7mm Stretch Magic. Pearls can be re-drilled to enlarge the holes; Pearl Paradise are one company who do this. 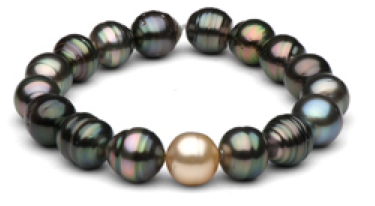 Once that little detail is in hand, you can play, mixing in other beads or pearl varieties. A YouTube video shows you how to hide the knot, essential to a neat piece. These look terrific worn as multiples. If you try the DIY route and it doesn't work out, you can always do what I did: have a good laugh and see a sympathetic and talented jeweler. And remember, what sits unworn isn't much fun. Reno away! like the pearl bracelet. The prices of that company are so reasonable. The idea of taking some of the dated jewellery in my box (like my old diamond) and using them is a great one. Beautiful selections...I really like the first one and the cuff! But I am one of those who pulls out the needlenose pliers and plays with necklaces...it is great fun!! You always have such great ideas, Duchesse, and now you've given me some! 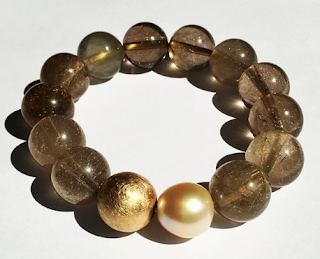 I'm coveting one of those pearl stretch bracelets now (most off-the-shelf bangles/bracelets are too big for my hands/wrists, which is why I go for the stretchy ones). And I love the idea of inlaying a stone on a cuff, remarkable! 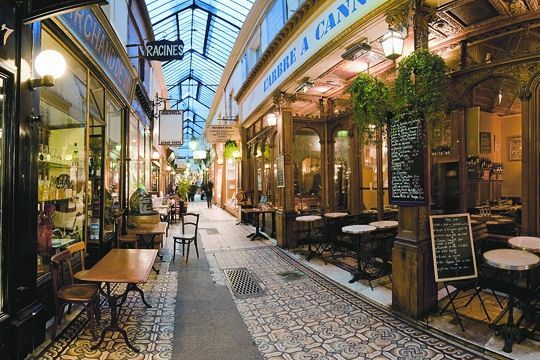 You have some gorgeous examples Duchesse! 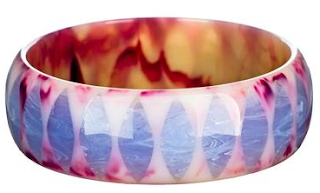 I never knew that Bakelite could be dressed up so beautifully. Jewelry must be your passion. 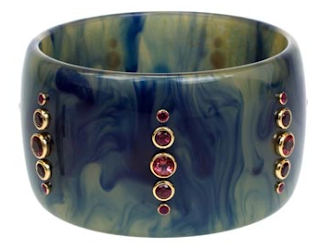 There is something dreamy about sparkly stones set into bakelite or resin, a la Alexis Bittar, or a wide metal cuff. (I seem to remember an exquisite gem-in-metal bracelet you modeled once for us, a gift from le Duc...) Thanks for the sampling. My most recent DIY reno involved a 1960s choker--chubby graduated pearls (faux, I'm afraid--hold your nose, Duchesse!) of the most ethereal pale ballet pink. The string broke, the clasp had had it, and the length was just too short to be flattering. I re-strung it, separating the pearl beads with small shards of real pink coral and slivers of shell. The finished piece is very pleasing to me--casual, luminous--and will go with me on vacation to Florida next month. All: A heavy cold prevents me from responding to each comment; thanks for these just the same. Rest up! There are some miserable colds out there -- hope yours doesn't last too long. Loved the cuffs, thank you. Wow. Those two cuffs are things of beauty. I have culled the horde for the things I want to renovate, now I just have to execute. I will, some day. I do hope you feel better soon. Getting sick is so abominable. Can I learn something from hate mail?